Add contents of package to 1 3/4 cups of Canola Oil in a 2-gallon zip top bag and mix well. Add four tubes of Premium Saltine Crackers. Seal bag filled with air. 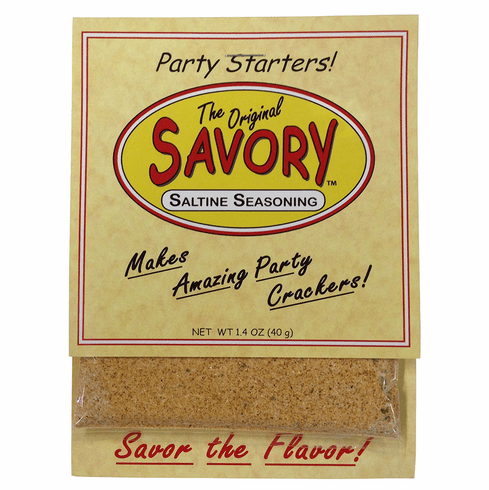 Toss crackers in bag every 5 minutes, or continually until Savory Seasoning is absorbed. Let crackers rest at least four hours or overnight for best taste. Add 5 tsp of seasoning to a scant 1/2 cup of Canola Oil in a 1 gallon zip top bag. Add one tube of crackers and follow above directions. Hint: Refrigeration or freezing extends flavor.